A BASE jumper snagged in a tree, an injured landscape photographer and a walker with heart problems kept a Lakeland rescue team busy with three callouts in one day. Keswick Mountain Rescue Team was alerted shortly after 6pm on Friday when a woman looking out of her window near Thirlmere spotted a BASE jumper leap from the top of Raven Crag. She witnessed him land half way down the crag, caught in a tree, and rang 999. Keswick Mountain Rescue Team sent two vehicles to the scene, one travelling up a track at the back of The Benn, leading up behind the crag, and the other going along the reservoir dam to try to spot the parachutist’s position. A team spokesperson said: “His chute could be seen hanging on the crag, but fortunately a team member who had gone direct met up with one of his companions who told her that the casualty had got down safely. Earlier, the volunteers from the team were called to the path between Rosthwaite and Watendlath where a 70-year-old man was reported to be suffering from a ‘racing heart’. A woman walker came across the man and raised the alarm from a nearby hotel. The team spokesperson said: “The team set off to Rosthwaite with two vehicles full of personnel, and checked on the availability of the air support, given the symptoms displayed. “Initially, it looked as if no air ambulance would be available, and as the casualty was some way up the hill, the Coastguard helicopter from Caernarfon was requested. “Fortunately, Helimed 58 [the Great North Air Ambulance] became available after the job it was on was dealt with, and was able to land reasonably close to the casualty site. 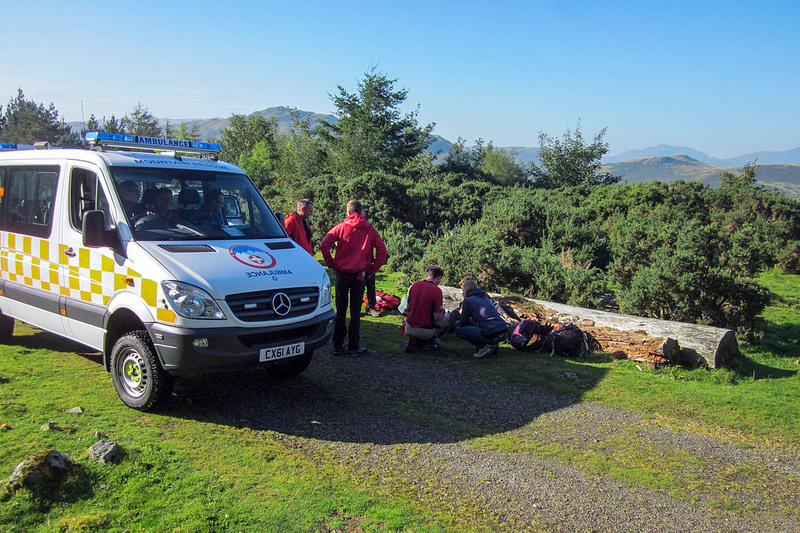 The team’s first callout on Friday came when a 26-year-old man, taking advantage of the stunning weather to take photographs on Threlkeld Knotts, fell more than 160ft and injured himself. He stepped over a wire fence surrounding Hill Top Quarry, the ground gave way beneath him, and he fell about 50m and hit a rock spike on the way down. The team spokesperson said: “He suffered what appeared to be a serious leg injury, but was otherwise relatively unscathed. “He landed in the base of the quarry, but was able to crawl to a point where he could phone for assistance. An ambulance was able to get relatively close, but the team managed to drive its four-wheel-drive Sprinter ambulance right next to him. He was given analgesia, was splinted, and then transferred by Sprinter to the ambulance 400m away. The ambulance then took him to the Cumberland Infirmary for treatment. The team was later informed his injury consisted of soft tissue damage to his ankle and cuts and bruises. He was, the spokesperson said, a lucky man. "He stepped over a wire fence surrounding Hill Top Quarry, the ground gave way beneath him, and he fell about 50m and hit a rock spike on the way down"......I wonder what the fence had been put there for? Hope the tree under Raven Crag is OK.